The year was 2013 when I posted a dish by the Hairy Dieters to illustrate on strange food habits. Like, for example, eating over and over again the same dish or ingredient for a whole season. Over and over again… The dish in question was orange and fennel salad with harissa dressing (here). 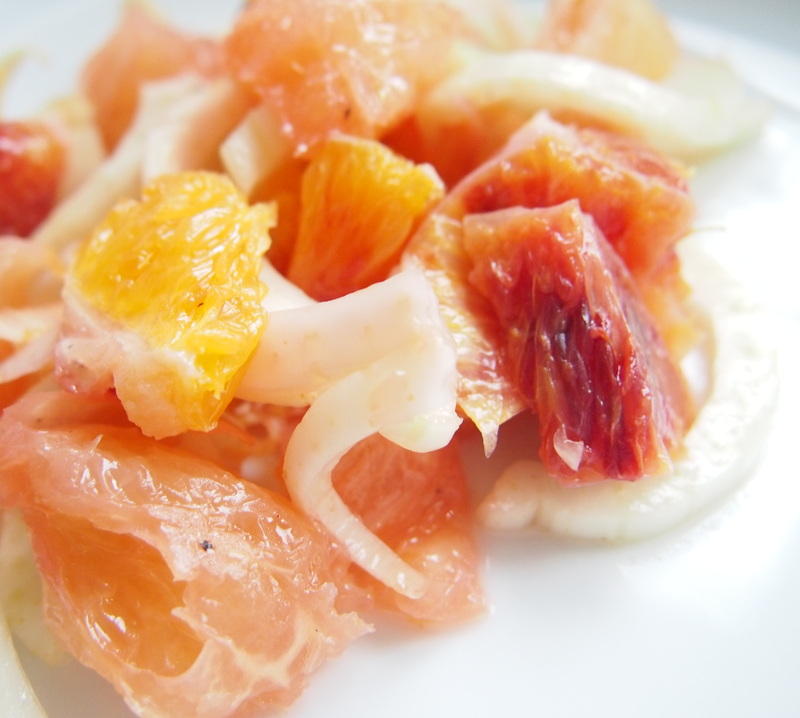 Almost 2 years after, another fennel and citrus salad shows up, this time to explain that grapefruit (and avocado) are my food crazes of 2015. Well, citrus were exceptionally good this year and any excuse was good to have them. Not trying to convert this in a head to head citrus salad competition…. this one is a more sophisticated and chefy, ideal to impress dinner parties mobile calorie intake units guests. Also, it calls for the best ingredients you can find. There is no harissa to hide in this one. In any case, totally worth the effort. Using a sharp knife, cut the skin and white pith from the grapefruits and oranges. Working over bowl, cut between the membranes to release the sections into the bowl. Squeeze the membranes to extract the juice. In a small bowl, stir the olive oil with the honey and lemon juice. Add 3 tablespoons of the citrus juice and season with salt. [You most likely won’t need all the juice] In a shallow serving bowl, toss the fennel and citrus sections with the dressing. Garnish with the mint leaves and ground coriander and serve right away.